Most participants will stay at a Residence Inn in Fairfax City. The hotel will provide vouchers for using the CUE bus to the GMU campus each day. If you have friends or relatives in the area with whom you’d prefer to stay, you may do so. If you are staying elsewhere, you are responsible for transportation to campus. The Residence Inn is on the CUE Bus Green Route (schedule here). 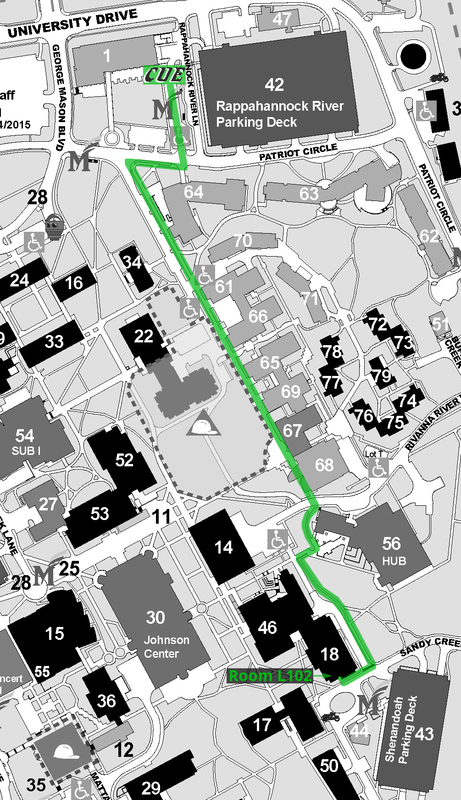 Green Route #2 will deliver you TO the GMU campus, whereas Green Route #1 will return FROM campus (map here). The classroom portion of the Institute will be on George Mason University’s Fairfax campus, in Room L102 in Exploratory Hall. The CUE Bus Green Route will drop off and pick up near the Rappahannock River Parking Deck. Check this map to see the easiest way to walk from the bus to our classroom. If you miss the bus, you can wait for the next one or call a cab. Fairfax Connector bus, within the immediate area, and to other parts of Northern VA.
“Gunston Go” bus service from Shenandoah Parking Deck to Fair Oaks Mall and other shopping areas in Fairfax, including Fair Lakes (near a Target and Best Buy). Metro: Try the Trip Planner to plot your course around Metro train (subway) and buses. The closest stop is Vienna/GMU at the end of the Orange Line. It is possible to drive your own vehicle to Fairfax, and you will be reimbursed after the institute for mileage. We do not pay for rental cars. Free in DC blog with up-to-date listings of free activities in the area. City of Fairfax Farmers Market,Saturday and Sunday. The BIG Maze at the National Building Museum. Reading room tours at the Folger Shakespeare Library (registration required, Saturdays only). We will provide a handful of breakfasts and lunches, but all participants will be responsible for feeding themselves during the institute. After the institute ends, each participant will receive a check containing their per diem ($100/day), which is above the current federal per diem rates for Washington, DC. Because of university policies, we cannot provide this before the trip. Any DC area participants will use the per diem to pay for their transportation and/or parking to and from GMU. Processing of forms and generating payment will take at least 4 weeks. For any international, non-US citizens participating, please understand that processing of per diem may take a few months. Please plan accordingly. There are three major airports located in the Washington D.C. Metro area. Therefore there are different alternative transportation options for getting to and from Mason’s Campuses using alternative transportation.